I figured with beach season around the corner it made sense to talk about the fat burner first, since it seems like everyone is trying to make those final preparations for their bikini. I know I personally have been. I’m dedicating so much more time to my abs these days in anticipation of my annual girls trip to the Bahamas with my fitties. I know the girls will be lean and mean as ever. The best I can hope for is to not embarrass myself down there and show up looking like a whale. I think I’m pretty close to where I need to be but not quite there yet. My quads and thighs are still lagging just a tiny bit, and of course I’d love more definition in my abs. I find it so hard to get any new cuts in my abs that I’m starting to second guess my training regimen. I feel like it must be getting stale or something because I feel like I haven’t seen a new cut in my midsection in ages. Sigh. Anyways if you have a good ab workout that you like can you please let me know? Shoot me an email or tweet me or something. Ok let’s get back on track. Stronggirl fat burner. I took Stronggirl for the token 3 week trial run, with my last day concluding just yesterday. So as I sit here today, the effects of the past weeks are staring me in the face. And honestly they’re pretty good. Here are the effects that I noticed by week. These are the actual notes that I took down during the trial period. Excuse the goofiness of the second week I think I was a little tipsy. Week 1: Started my Stronggirl Smart Weight Loss program exactly one week ago. Looking in the mirror now, It’s tough to tell if the product has helped me progress in any significant fashion. I started my weeks workouts a little tardy this week since I was traveling to visit friends until Monday- so the difference between getting five workouts versus the seven workouts is kind of apparent. For instance usually after my first week on a new fat burner I notice an overall kind of leanness that I hadn’t the week before, just because the sheer number of calories burned is greater. Since I missed those couple workouts, that could’ve been the difference between a 500 and 3000 calorie deficit. Obviously the latter can have a visual impact on your body. If I had to pick out a difference in my body as I look at it now, I guess I could say that my sides and lower back are looking a little bit tighter. It’s been an area that I’ve wanted to address for a few months now, and I think the Stornggirl fat burner has helped me take those first steps towards results. You know when you tilt back and to one side and the sides of your lower back start to get those awful looking folds and you turn your nose up in disgust? Yeah that’s the problem that I’ve bene addressing. Hopefully week two brings even more progress towards that goal. Week 2: This has been the second week of taking Smart Weight Loss by Stonggirl. The first week was pretty unremarkable, but maybe compromised by how I missed a few of my training sessions. This week I hit every session on the nose and had fantastic workouts at that. Some of the best workouts come after a brief period of taking some time off, which is what I did the weekend before I started. Even though I had arguably one of the most unfortunate eating weekends of my life, I strangely came back feeling rejuvenated and ready to attack my goal. After this second week of Stronggirl I have seen more than just my lower back make progress. My tricep definition has become straighter and more pronounced on the outside of my arms- you know, the line that divides the tricep and bicep down from the shoulder? The one that’s almost impossible to get? Yeah I’ve started to make progress with that one. Week 3: This was my last week using Smart Weight Loss and I can now confidently give it a confident review. The effects have been more pronounced than ever. The progress in my back and arms has continued to be marked, and furthermore I think I’m actually starting to get a bit of thigh gap. And that’s despite ramping up my squatting and resistance work, which usually just makes my groin muscles bigger and therefore closer together. My overall vascularity and muscle tone seems to be of higher quality than it was three weeks ago and I’m perfectly willing to credit my new fat burner to that. If you’re wondering what my protocol for dosage was for the duration of my review period, it was a little different than what was prescribed on the bottle. The bottle says that for basically the first week you are supposed to only take one capsule 30-60 minutes before a meal. But since I’m pretty experienced in taking these supplements (yeah. I’ve reviewed a crap load of fat burners), I decided to go with two capsules first thing in the morning, and then one capsule in the afternoon. On workout days though, I would take just the morning dosage. You should be aware that this is a stimulant dependent fat burner so you want to be cognizant of your other sources of caffeine. Ok. So the product works, and works pretty darn well. Are there any side effects to taking Stronggirl Smart Weight Loss? I did not experience any real noticeable side effects when using this product. If I did have to put out one warning though it would be that you should not take this product too close to drinking alcohol. I took my last serving too close to my bff’s birthday party and I ended up having to go home early because I started to feel kind of jittery and uncomfortable in my stomach. I guess this one’s sort of a no-brainer but if you are going to be drinking or partying later that night, I would probably just not take Stronggirl at all on that day, just to be safe. But how is that? Which ingredients are responsible for the effects? So side effects are minimal. Let’s get back to talking about the effectiveness, and Which ingredients are responsible for the effects. Here are the key ingredients found in Stronggirl Smart Weight Loss diet pill for women. You will notice that it has a nice vitamin and micronutrient complex to start, and is followed up by the Smart Weight Loss Plus Blend. The first thing that I noticed is that they don’t really tell you how much of each ingredient is really in here, which means it’s a proprietary blend. I’ve never been a big fan of prop blends, but at the end of the day supplement companies need to use them so that they can keep their costs down and so that companies can’t copy the ‘secret sauce’ recipe and compete by making the identical product. Some other things of note is that this formula makes use of both Green Coffee, and Garcinia as the key drivers of the fat burning. I’m a little surprised that they wouldn’t add in some of the more reliable and popular additions such as green tea or synephrine. They also didn’t put in any L-Carnitine which is borderline unheard of these days. I’m not complaining though, since it seems like almost all the products are the same now. This formula is distinct in that it doesn’t include some of those that we’ve come to expect. It adds to the character of the product and actually worked really well for me. Now that the meat of the review is out of the way let’s serve up the potatoes! That’s right, it’s time for the packaging review! Wow. I must be going soft. Because this is the second of the last three reviews that I’ve gone and given a product an actual A on packaging. And this product might deserve it even more than the others. Here’s what I love about Stronggirl’s packaging for their fat burner. It’s deliciously purple. And The yellow accents stand out in beautiful contrast to the purple with the textured background. The white text is organized and uses stylish fonts. The materials are of high quality and convert a sense of luxury and effectiveness that surprisingly you don’t always find in women’s fat burning products. 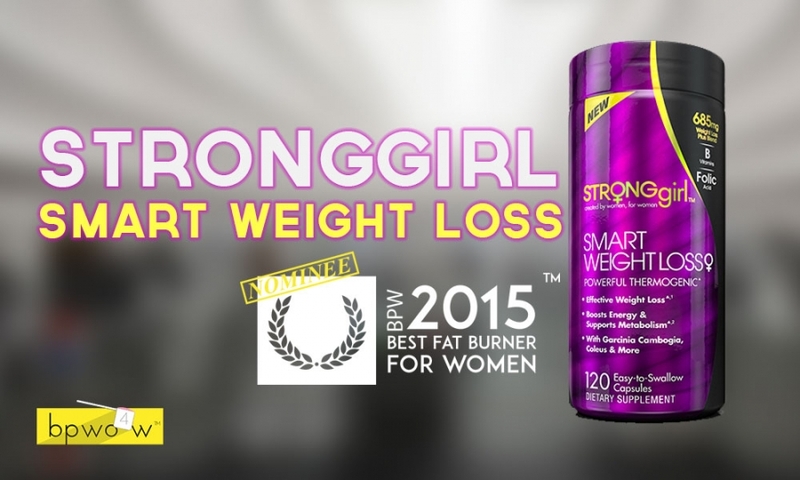 Stronggirl really got it right with this design and I’m confident that they’re going to sell tons of the Smart Weight Loss fat burner for women.